Sure, you've tried many a stir-fry. 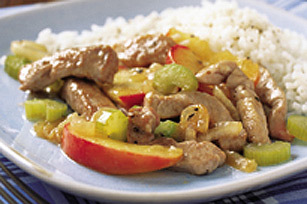 But have your tried a Maple-Pork Stir-Fry recipe with rice, pork tenderloin, onions, celery, apples and a splash of maple syrup? Try it - you'll love it. Cook rice as directed on package, omitting salt. Meanwhile heat oil in large skillet on medium-high heat. Add meat; stir-fry 5 to 6 min. or until done. Remove from skillet; set aside. Add next 5 ingredients to skillet; stir-fry 5 to 6 min. or until vegetables are crisp-tender. Return meat to skillet; cook 1 min. or until heated through. Cut all vegetables about the same size to ensure that they cook evenly.